Your truck can function in many different ways: towing, hauling, and transporting. If you use your truck for work, or just as a daily driver, you can find ways to make it even better by choosing the right upgrades. Seek out premium aftermarket truck parts to turn any model truck into the best possible version of itself. There are countless ways to upgrade your truck, and the seven listed below are enough to get you off to a great start. Choose a high-quality truck rack to manage all of your different load requirements and enhance the look of your vehicle. The best truck racks should be able to fit perfectly into the bed of your truck, so a customized solution is the best bet in that case. Pick a truck rack that is durable enough to last for the entire life of your truck and versatile enough to carry everything you need. The right spray-on bedliner can help revitalize the bed of an older truck, or it can help you protect your investment if you’ve just purchased a brand new one. Choose a spray-on bedliner that’s durable enough to stand up to even the toughest jobs. If you get the right quality, it won’t crack, peel, or warp– this allows it to permanently protect your truck from dents, scratches, and rust. The non-slip texture will also help keep your haul from sliding around in the bed. Side steps improve both the look and functionality of trucks and other large vehicles. This is especially helpful for trucks that are raised or otherwise tall enough to make entry and exit difficult. The best side steps will be durable to withstand all of the weather and driving conditions your truck can encounter throughout its lifespan. Choose side steps with a heavy duty motor, and they’ll be able to rise up to the body of your vehicle when you’re not in park. As soon as you need to get in or out, they’ll descend to offer a step up for you and your passengers. 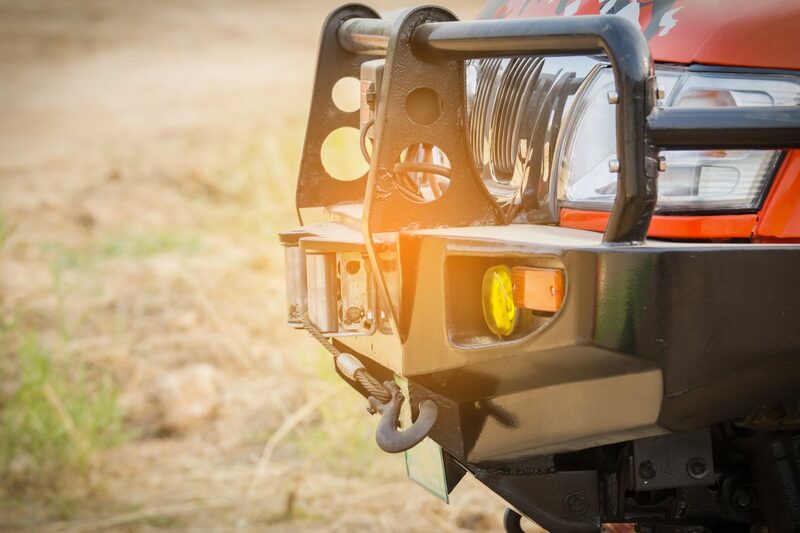 Light bars can make your truck look like an absolute monster after the sun goes down, and more importantly, they’ll give you way better visibility. LED light bars are up to 20 times brighter than your average factory HID headlights, so you’ll be able to see where you’re going no matter how dark it is outside. Your driving experience will be so much better when you can proceed with confidence thanks to enhanced visibility. The grille is one of the most iconic parts of the design on many trucks, so keep yours safe. A grille guard will also make your truck look tough, and protect your front end in the unfortunate event of an accident. Shop a wide selection of brush guards to find one that complements your specific vehicle. They come in a variety of different diameters of steel tubing, and the heavy duty uprights offer ultimate safety and security. One of the best things about a truck is its ability to tow. Consult your local automotive experts to get a hitch and the appropriate wiring, then get the most out of your truck’s capabilities. Messes happen no matter how you use your truck– protect your investment with floor mats to preserve the interior. Autohaus Automotive Solutions is your local source for custom car accessories and truck upgrades in Hayward, CA. We offer a wide range of products and services that allow drivers to make their vehicle better than they ever thought was possible. Contact us today to learn how we can turn your truck into an upgrade head turner.